From December 5 to 7, 2018, the Climate Clock was projected at the corner of De Maisonneuve Boulevard and MacKay Street, thanks in part to Elastic Spaces member, Damon Matthews, professor in the Department of Geography, Planning and Environment and Concordia Research Chair in Climate Science and Sustainability. The Climate Clock is a visualization tool developed by Matthews and David Usher, founder of the Human Impact Lab. 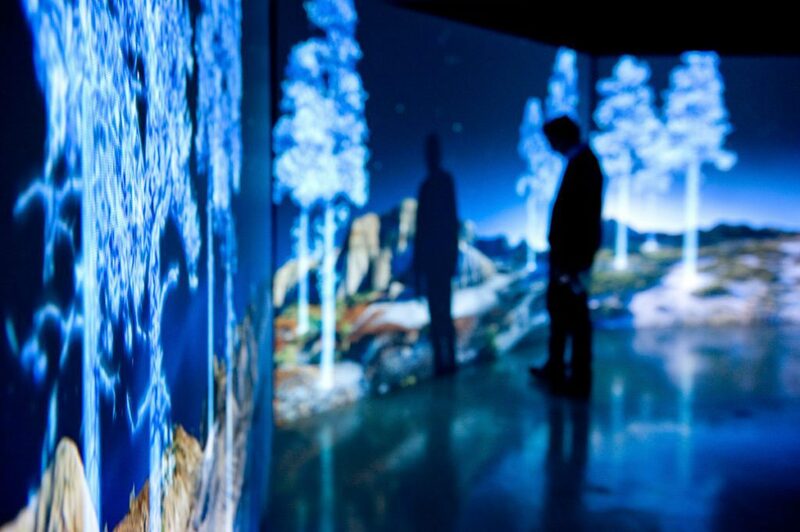 It harnesses data, art, technology and interactivity to add to the conversation about climate change. “If greenhouse gas emissions continue to increase, we will reach 1.5°C of global warming in less than 16 years. This is the direction we’re headed right now, but it’s important to stress that this is not the direction we need to take,” Matthews says. “There are actions all of us can take to reduce our carbon emissions and add time to the clock.” The projection of the clock coincided with COP 24, a United Nations climate change conference in Poland. The event also marked the release of new data about carbon emissions, to be published by the Global Carbon Project. For more information, check out the link below! 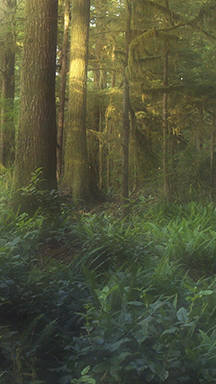 Many of the artworks in Supernatural: Art, Technology and the Forest are located on Vancouver Island, including Ian Wallace’s Clayoquot Protest, Mike McLean’s Jorden River series, and Leila Sujir’s Forest Breath. But seeing the forest through the medium of photography is a different experience from actually entering the forest. Or virtually seeing the forest through a stereoscopic video for that matter. 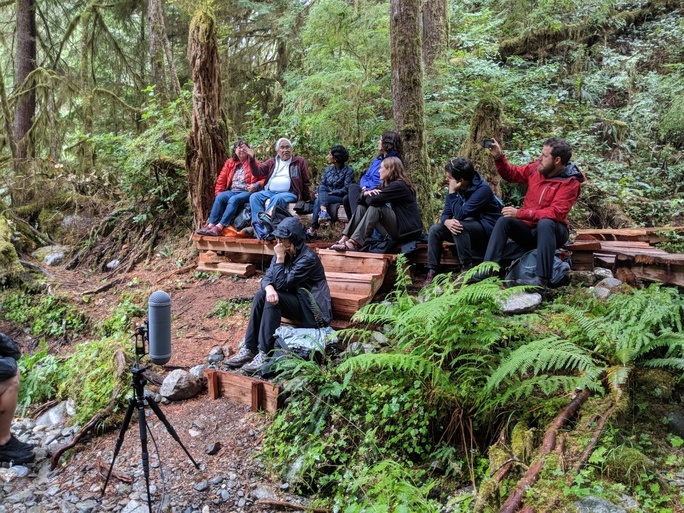 Part of the OFFSITE|INSIGHT program, Forest Breath: A Portrait in Progress offered a time for artists, environmentalists, and the Port Renfrew community to encounter a hard-to-reach old-growth forest known as the south Walbran. Forest Breath: A Portrait in Progress invited Supernatural artists Mike McLean, Kelly Richardson, Carol Sawyer, and Leila Sujir to further the conversation surrounding the exhibition on topics of contested territories, activism, and ecology on August 11. 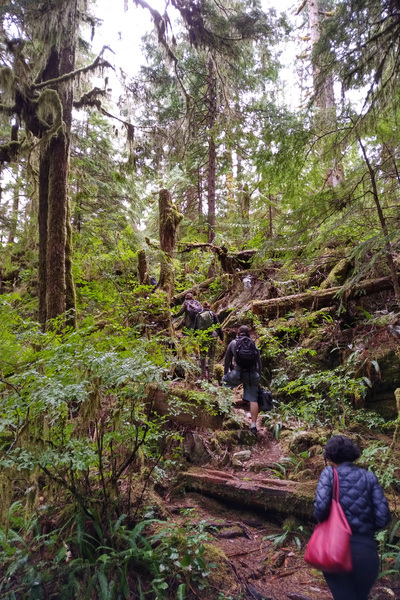 The group traveled to the southern Walbran Valley, the traditional territory of the Pacheedaht Nation. While part of the Walbran Valley was protected in the early 1990s in what is now known as the Carmanah Walbran Provincial Park, the south Walbran remains unprotected from logging. 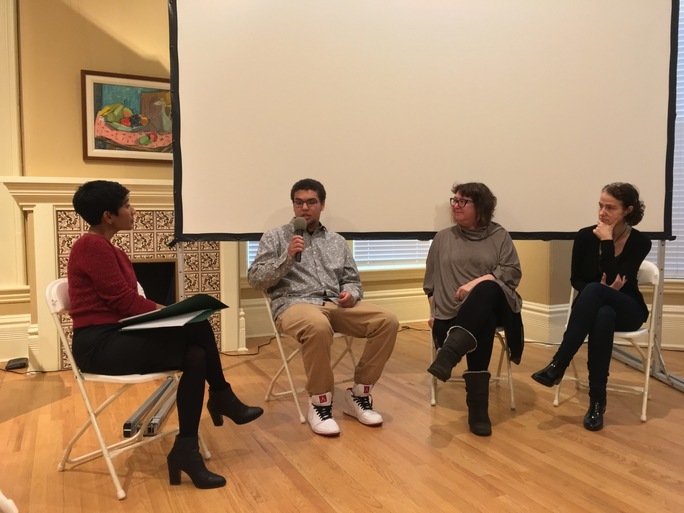 Facilitated by Supernatural curator Haema Sivanesan, the conversation also included Pacheedaht elder Bill Jones; Peter Cressey, Jessie Demers, and Erika Heyrman from the Friends of Carmanah Walbran; and Torrance Coste and Emily Hoffpauir from the Wilderness Committee. The stories and words of Bill Jones became especially pervasive throughout the conversation. Bill explained how “life is eternal” using the forest as a symbol of how humans should be living with seven generations in the future in mind. He cited examples of how nurse logs, or fallen trees providing resources for seedlings, support the newer generations even after their demise. His insightful and thoughtful stories about the territory allowed for the other participants to speak personally on what the Walbran meant to them. 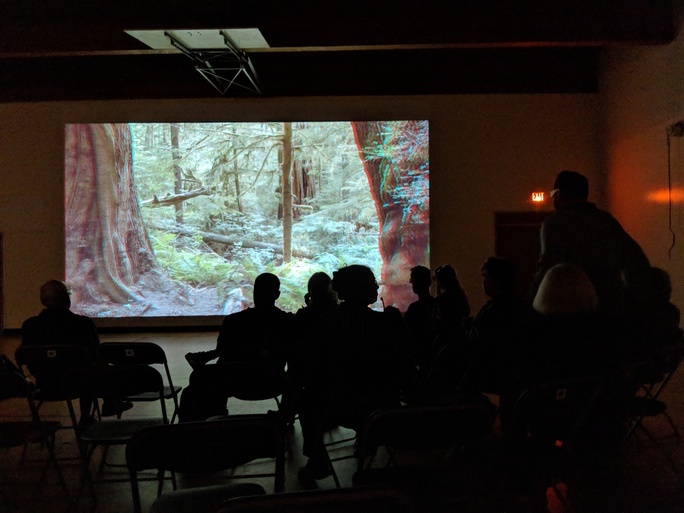 The public then joined the group for a screening of Forest Breath held at the Port Renfrew Elementary School on August 12. 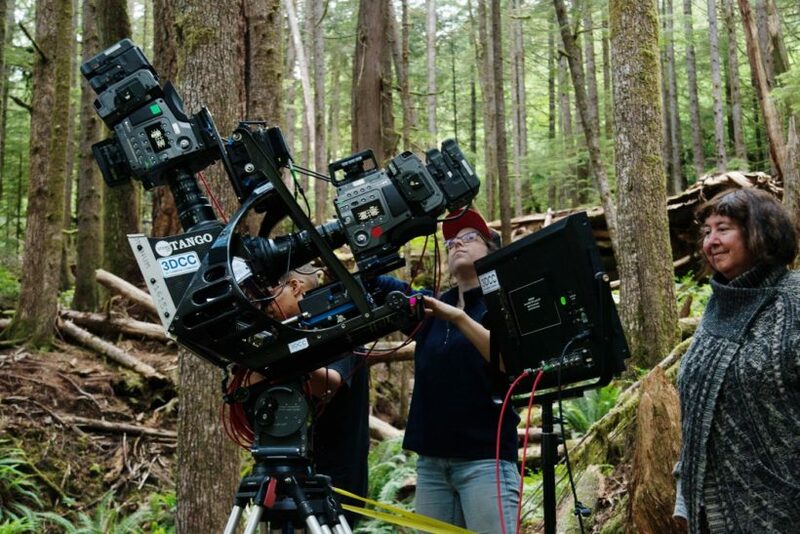 Leila’s Forest Breath is a 3D stereoscopic video installation filmed with an IMAX rig with two Sony F65 8k cameras in the south Walbran. Thanks to a special installation with Leila’s technical director Jorge Zavagno, audiences were able to “walk through” the forest as the 3D effect became a layered extension to the gym’s space. 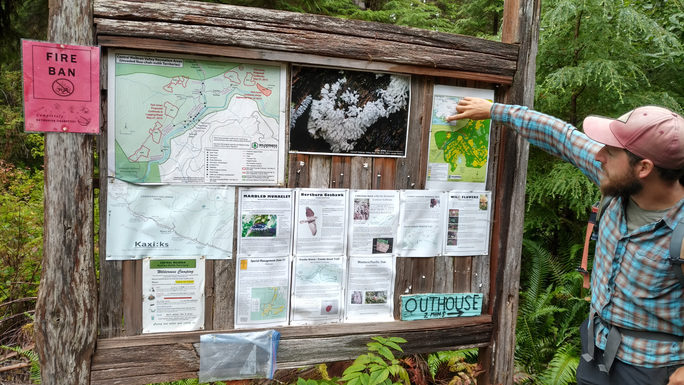 The greater Port Renfrew community was asked to contribute their insights and perspectives by talking directly with Leila. These comments will then be used by Leila to help her finalize installation for a future Art Gallery of Greater Victoria exhibition. 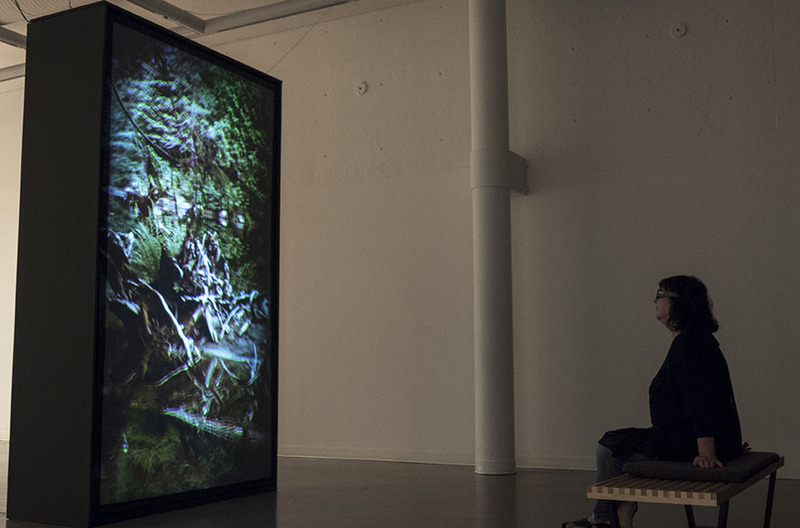 You can continue to explore the forest through visiting Supernatural: Art, Technology and the Forest on until September 30 in the Founders, Drury, Centennial, Ker and Lab Galleries. Kelly Richardson, The Erudition (2010). Installation view at NGCA UK. 3 screens, 48 feet x 9 feet; HD video with sounds, 20 minute loop. Courtesy of the artist and Birch Contemporary. Photo: Colin Davison. “Supernatural: Art, Technology and the Forest” at the Art Gallery of Greater Victoria seems less intended to provide directives than to register tensions. Curator Haema Sivanesan indicates gestures of connection without becoming explicitly political, while upholding a sense of reverence that accommodates moments of both open-endedness and opacity. A powerful introduction to the show, Kelly Richardson’s three-screen video installation The Erudition (2010) presents a nocturnal hoodoo landscape haunted by twitching holographic trees. This film-negative aesthetic, recalling the spectral landscapes of Peter Doig, evokes both intimacy and unease: a state of being not-at-home at home. Contrasting with The Erudition’s atmospheric ambiguity are geographically specific works in which forest composes both site and archive. Ian Wallace’s Clayoquot Protest series (1993–95) presents large photographs of the historic protest, featuring acrylic-print insets of woodgrain cross-sections. A nearby monitor screens Bones of the Forest (1995) by Heather Frise and Velcrow Ripper; this documentary features First Nations Elders, alternative loggers and corporate apologists, spliced together in a nod to punk’s DIY ethos. Leila Sujir, Forest Breath, 2018. Stereographic 3D video Projection; 5 minute loop. Cinematographer: Christian Kroitor. This contrast—between document as frame and forest as continuum—continues in the video How to climb a tree (2017) by photographer and video artist Sandra Semchuck and performance artist Ayumi Goto. Offering abstract homage to Squamish carver Robert Yelton, Goto moves through forested space in a dance aligned with Semchuk’s continuo of overtone singing. Semchuck’s practice is also represented by a series of landscape photographs overlaid with text. The relentless density of Semchuk’s settings—all middle ground—and the ambiguity of the speaker or listener in the texts allow for an intersubjective approach that moves beyond genre. Trudi Lynn Smith, Breath Camera — prototype 1, 2015–ongoing. Documentation of the camera being used in field-based research into contested territories/burned landscapes, 2016. Darkcloth (velvet and cotton), hand-built camera (suede, bellows, optical lenses, screen material); dimensions variable. Courtesy of the artist. Transformation via camera is at hand in two other photo series: Dan Siney’s Stump 1, 2, 3(2008) and Rodney Graham’s Study (5 Polaroids from Series: 75 Polaroids) (1976). Siney’s anthropomorphized stumps are the result of loggers cutting eye-like notches into trees for springboards before cutting. Blurrily monumental, they are accidental votives in a state of fertile decay. Graham’s pictures, likewise, make strange a kind of lark: a walk through the forest at night with a Polaroid camera. Tantalizingly hermetic, his images stage a provocative vanishing act. Carol Sawyer’s Woodwork (2011) consists of seven short videos made from archival footage of the logging industry. The truncated videos develop a metanarrative: fragments of an epic depicting epic fragments. Mike Andrew McLean’s series JR (2015–ongoing) documents the ongoing narrative of “ghost town” Jordan River, northwest of Victoria. 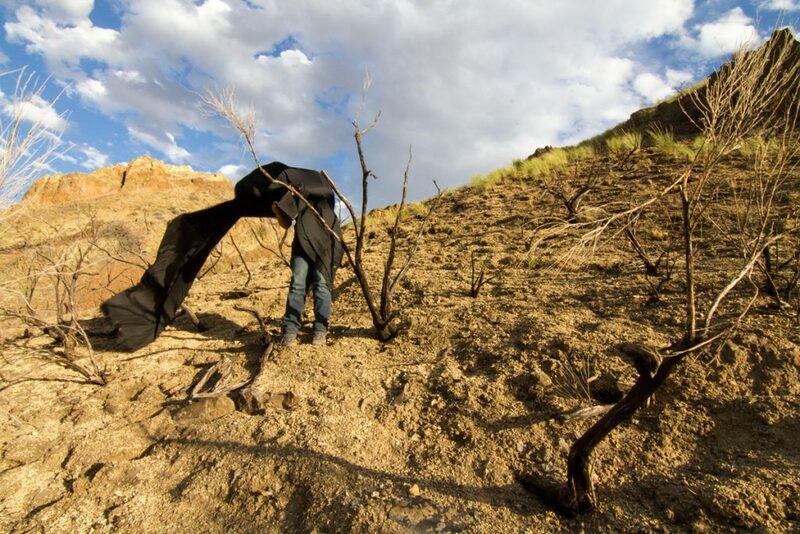 In 2014, residents were told that the combination of a nearby dam and seismic activity meant the threat of sudden flood in the event of an earthquake, an apocalyptic prophecy that loomed large for the artist as he traversed these remnants of the town with his large-format camera. Notable is his use of scarce Kodak Aerochrome film, developed for military and surveying aerial photography, which tints organic material in hues of pink and crimson, summoning counterpoints as richly varied as Frederick Edwin Church, Walt Disney, Richard Mosse and Edward Burtynsky. A defining non-feature of “Supernatural” is its absence-as-presence of Indigenous voices. With its focus on photo-based media, the story of the forest presented here is one of Cartesian colonial methodologies: capture, extraction, taxonomy and commodity. This point is underscored by the accompanying exhibitions in the gallery: “Form as Meaning,” a survey of Indigenous printmakers, and “Picturing the Giants,” a show of Emily Carr’s work in dialogue with pieces by contemporary First Nations artists like Sonny Assu and Lindsay Delaronde, among others. Between these exhibition offerings, indigeneity is performed in varied guises, transposing itself and reorienting its audience, with the forest—home (for some) to formlessness, and at the very least, home to phenomena that elide photographic capture—as informal host. John Luna is a poet, critic and visual artist whose practice includes painting and installation, and a teacher working in the areas of art and art history. He is based on Vancouver Island. Where: Art Gallery of Greater Victoria, 1040 Moss St. Note: Admission on May 19 is free from 10 a.m. until 5 p.m. The junction where technology meets the environment has become an uneasy meeting point in the modern era. A bygone phrase about ecological conservation — “Take nothing but pictures, leave nothing but footprints, kill nothing but time” — would suggest humankind’s need to dig deeper into the biosphere runs contrary to the ecosystem ethos. On the other hand, how do we learn about the environment without studying it? That’s what a new exhibit at the Art Gallery of Greater Victoria is attempting to answer. Supernatural: Art, Technology and the Forest, which opens Saturday and runs through Sept. 3, is a multi-media presentation that uses videos, photos, and computer-generated images to examine the forests of B.C. The goal is to better understand the forest and how human interaction with it will adjust, according to exhibit curator Haema Sivanesan. Eight Canadian artists (Mike Andrew McLean, Kelly Richardson, Carol Sawyer, Trudi Lynn Smith, Sandra Semchuk, Dan Siney, Leila Sujir and Ian Wallace) and one collaborative team (Ayumi Goto and Sandra Semchuk) are participating. 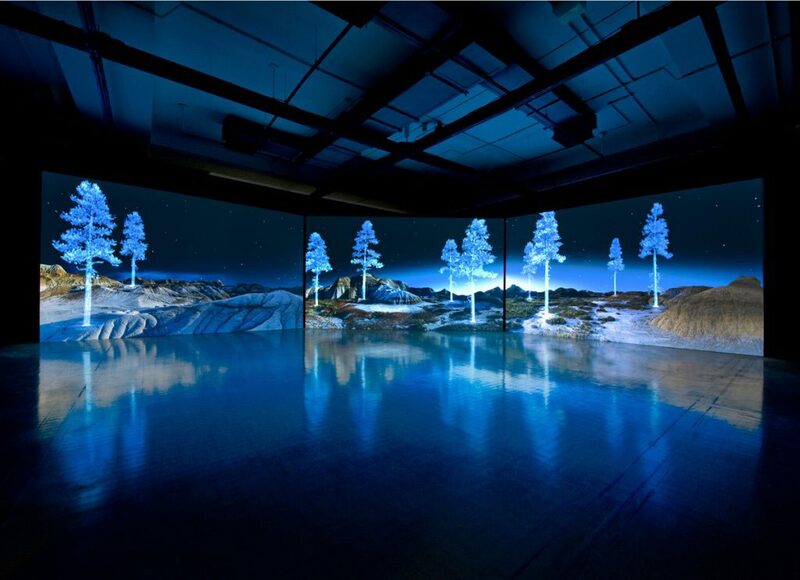 Their art ranges in tone and medium, from Richardson’s computer-generated imagery with sound that takes up a whole room of the gallery to Sujir’s blackbox-style Imax 3D captures of the Walbran forest. On February 25 Leila Sujir presented her film For Jackson: A Time Capsule from his Two Grandmothers. Leila Sujir’s nephew, Jakson Sujir was also present for the screen. 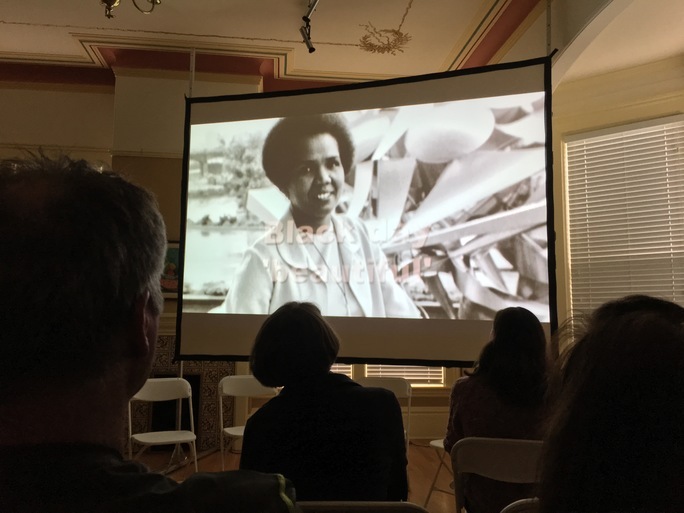 For Jackson: A Time Capsule from his Two Gramothers is a documentary portrait of two Canadian women, Rosemary Brown (1930-2003), BC’s first black MLA, and Ruth Horricks-Sujir (b. 1925) who as a young woman, moved to India. The film creates a time capsule for their young grandson, Jackson, who is a hip-hop artist and rapper in Vancouver. Leila Sujir compiled video footage over many years to explore memory, as well as archival material in film and photography to piece together the histories of Jackson’s grandmothers. She moves the viewer through the geographies and journeys of the women’s lives.